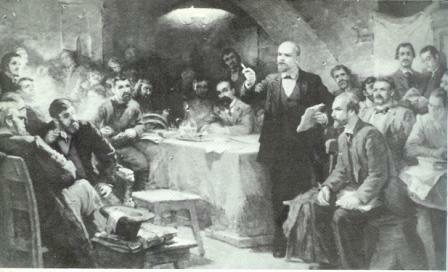 On July 30, 1903, the second congress of the Russian Social Democratic Labor Party (RSDLP) was held in Brussels, Belgium. While the meeting was supposed to unite the party, instead it split in two. Lenin headed the Bolsheviks, who believed that violence was necessary for the revolution to succeed. The Bolsheviks thought that only a violent uprising in the proletariat can truly create a communist state, with the rebellion to be headed by a small number of intelligent revolutionaries. The Mensheviks, on the other hand, believe that reform and democracy will gradually bring Russia into communism. They thought that the formulation of a parliament and organization into different parties will allow Russia's working class to gain more power. Lenin gave his group the name "Bolshevik", which means majority-class. His opponents he called "Mensheviks", which means minority-class, although, at the congress in Brussels, there were more Mensheviks than Bolsheviks. During the civil war following the overthrow of Czar the Bolsheviks represented the red army and the Mensheviks represented the white army. The Mensheviks wanted to later establish a monarchy, which was not supported by the Mensheviks.